Today’s post is dedicated to laziness. After a week off training and so much of everything else I normally do it seems appropriate. It’s also a bit of a mix of content as there’s not too much to tell from a seven days spent mostly laying about doing nothing! I do have a chart though. Binge Eating! I promised myself a week off and time away from the Paleo Diet. I think I delivered on all counts there. I treated myself to a Domino’s Pizza (Full House for those interested). I know, they’re not the best, really that wasn’t the point. It was all about having some greasy, junk food I enjoy. It ticked the boxes on that count. I have eaten a load of cake and I really mean a load. I ate bread for a while, but found it didn’t do much for me. Completely at odds with the avoiding healthy foods I had porridge for a change! Fish and chips, biscuits with my tea, deserts and puddings with my meals… The list could go on. Unsurprisingly there’s been some weight gain. I expected as much, but trust in my ability to get to race weight. Being back on the carbs I noticed how easy it is to eat a lot. I definitely found that I was hungrier in general and that despite eating a lot of food soon felt hunger once more. Not so surprising with cakes, chocolate and biscuits, but porridge is promoted as giving long lasting energy. An omelette seems to do a much better job in that regard. Today marks a return to proper Paleo eating. I’m glad to be back! Some of the foods off the diet are fun in moderation. I can’t deny a fondness for cake. Outside of that though I genuinely enjoy Paleo more. The large meals of salad and vegetables and protein emphasis leaves me feeling much fuller. Hopefully it won’t take too long to undo the damage of my binge week! Ironman UK Bolton Course For those interested I’ve uploaded the course from my GPS. You can download it from GPSies.com. The route is exactly as ridden, 3 laps of the course on the day. Plenty of waypoints so nice and accurate too. I’ve seen people searching for this in my logs so hopefully it’s a help to them. 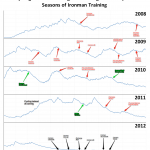 A little bit of a revisit to the subject of my Ironman UK taper. With the advantage of hindsight I guess I can claim it worked! At the very least I can say I was able to achieve my goals. I’ll never know if I could have done better by another route. Another of my favourite charts – straight from WKO+. I’ve mentioned them before, but to recap we have Acute Training Load (ATL), Chronic Training Load (CTL) and Training Stress Balance (TSB) corresponding to what might be termed fatigue, fitness and form. I’ve referred to Joe Friel’s blog and his views on tapering using this chart before. The aim is to have as high a fitness and form as possible come race day. Tapering reduces fatigue and improves form, unfortunately it also reduces fitness. So objectively the aim is to maximise the improvements in form and minimise the loss of fitness. Friel suggests that you want a taper to result in no more than a 10% decline in fitness. I’m mentioning these details because if you look at my chart above and follow the CTL (fitness) from a week prior to Challenge Roth through to Ironman UK you’ll notice far more than a 10% drop. I don’t think it’s surprising to find that I couldn’t stick to that guideline racing this close together. 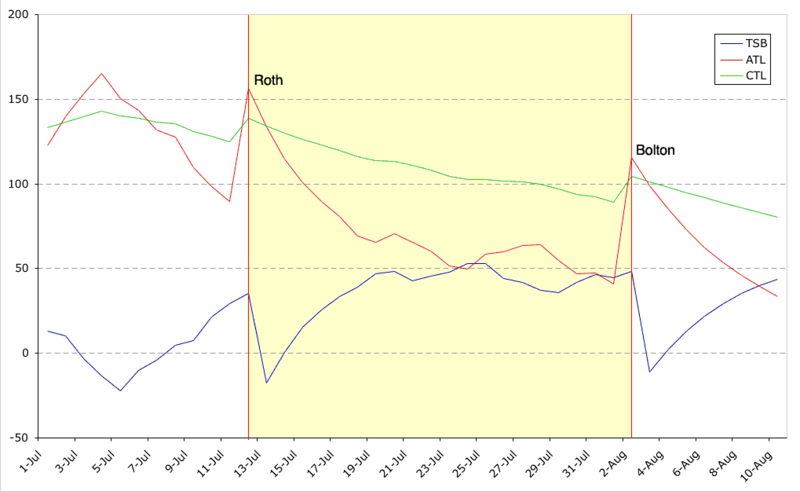 I tapered a single week into Roth and did stick very closely to the 10% reduction in fitness rule. I’d say I raced well in Roth, though felt I wasn’t as free of fatigue as I’d like. Whilst fatigue (ATL) and form (TSB) would suggest I should be pretty fresh. I think the reality of my months of training and racing weren’t showing through. Immediately following Roth I attempted to follow a plan that had plenty of light training. There were mixed results and I managed to train regularly, but certainly couldn’t manage much in those sessions. The result was there was no chance of limiting myself to a 10% reduction of fitness over that time. CTL declines pretty steadily over those three weeks. What training I did prevented it completely plummeting. In the final week before Ironman UK you can see it plateau a little as I’m able to train a bit more. At this point though the drop off was so large I was no longer concerned about any kind of 10% rule. Performance on race day was pretty good. I felt none of the fatigue I’d experienced in Roth and definitely felt able to work well throughout the race. 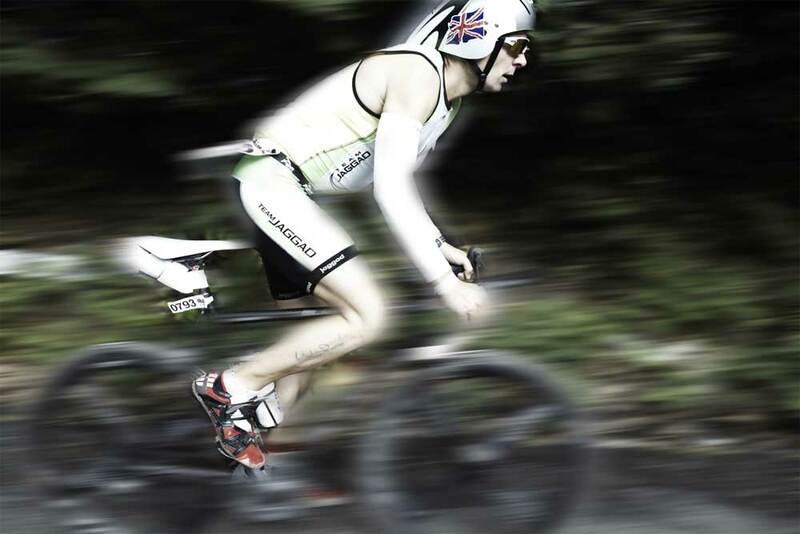 I would be hard pressed to identify a loss of real fitness between Roth and the Ironman UK. If there was it was more than compensated by that significant reduction in fatigue. My view is that after many months of high volume training with little break I needed a solid rest. As it happened a three week period of light training between the two races proved ideal. So I come to a full week off training for even more recovery. You can look back at the chart and see fitness dropping even further! For the past week I’ve felt terrible. My legs have been stiff and once again I’ve been retaining a lot of fluid. I’m curious to find out potential causes of this reaction. It’s only been Roth and Ironman UK where I’ve experienced fluid retention in recovery. Why it’s occurred for both these races, but not before is an interesting question. With the week now done I’m looking to get myself moving again and very slowly introduce training. Level off the loss of fitness and then start a gradual increase in a couple of weeks time. I wonder if the extensiveness of the taper for Bolton will help in the overall recovery process. Whilst the past week did feel awful I’m starting to feel good now. Hopefully a proper massage tomorrow will have my legs ready to start some exercise. Generally I’ve bounced back in two to three weeks after a race. I’m looking to be a bit more gradual about it this time. My focus now is on good dietary habits and a bit of weight loss ready for training. I’ll be thinking through the Kona build in a future post. Today’s picture is courtesy of Helen, go and check more of Helen’s photography or Tom and Helen’s blog. All good stuff as you can see from the awesome race photo.